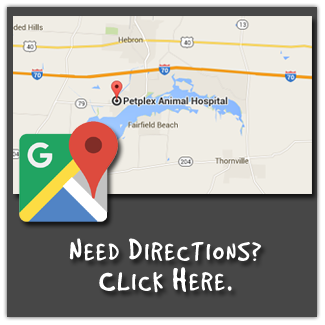 Petplex Animal Hospital accepts all major credit cards, personal checks, and cash payments. CareCredit is a third party financing company which is easy to apply for and can provide up to 6 months of interest free payments. This service costs the client nothing to apply for and nothing to maintain. At Petplex, we believe that this is a much sounder option for clients than pet insurance and urge all of our clients to apply, since we can never know what issues may arise. Your only costs, are those that you charge for services rendered. Petplex Animal Hospital pays for many servicing fees, so that you don’t have to. Care credit is also accepted by many dentists and optometrists for your own personal care. For more information or to sign up for CareCredit, click here. Pre Payment is another financing option which works well for many clients. For those clients that are on a fixed income or if you find those yearly visits and emergencies tough to budget, we can arrange a prepayment plan so that the finances are available when you need them. These funds are always available to be returned to you but are there for you when your pet needs them too.